Astilbes are one of the easiest perennial flowers to grow. They have long-blooming, plume-like flowers in soft shades of white, pink and red, and the flowers are held on tall, stiff stalks, above the airy foliage. Virtually pest free, they can light up the shade garden or soften a sunny spot, and, they are very low maintenance. Astilbe plants are also known as false spiraea, false goat's beard and meadowsweet. There are several species and cultivars within the Astilbe genus, with variety in the flower plumes. Most of the popularly sold Astilbes are hybrids resulting from crosses among the species. Astilbe is valued for bringing great long-lasting color to partly sunny borders, where tall colorful flowers are few. In addition, Astilbe provides a nice textural contrast to plants with large, broad leaves like Heuchera, Hosta, and Ligularia. Astilbe can also be grown in containers. Astilbe seed is available, but it can be difficult to germinate. It's easiest to start with a plant or division. Even a small plant will quickly fill out and perform well in its first year. Astilbe plants are widely adaptable and are hardy from USDA zones 3 through 8. In hot, dry climates, they need to be planted in the shade and/or given plenty of water. You can plant in either spring or fall but try and avoid planting in the hottest part of summer. If you must plant then, keep the plant well watered until you see new growth emerging. Different varieties will bloom anywhere from mid-spring to late summer. 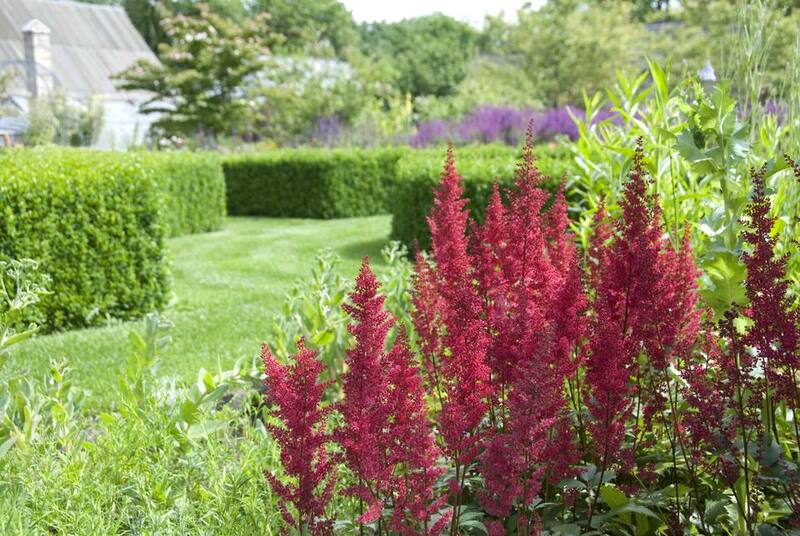 If you plant different types of Astilbe, you can prolong the bloom almost all season. The plumes remain in flower for several weeks and continue to look good as they fade and dry on the plant. No deadheading is needed since they will not bloom again. Astilbe plants grow best in partial shade but can also grow in full sun. Astilbe will bloom in shade, but the plants prefer some sunlight to achieve their full size. In hot weather and dry soils, their foliage will burn, so partial shade, plus plenty of water, is preferable. The biggest need Astilbe plants have is some relief from hot, dry weather. Either provide afternoon shade or extra water. They do not handle prolonged periods of drought well; the leaves will brown and dry and if left dry too long, the plants will die. Astilbe plants prefer a slightly rich, moist soil, as well as a slightly acidic soil pH of around 6.0. The warmer the weather, the more moisture Astilbe plants need, especially when situated in full sun. Astilbe plants are tough and can survive winter, even in harsh climates. After the first hard frost, put down 2 inches of mulch around the stem to regulate the soil's temperature. Astilbe plants need phosphorus to bloom, so choose a fertilizer with a makeup of 5-10-5 or 10-10-10. Rake the fertilizer into the soil two weeks before you plant or sprinkle a few granules onto the soil after the Astilbe has been planted. Once the plant is established, fertilize every spring when the soil is moist but the leaves are not. Divide every 4 to 5 years, to keep the plants healthy. Astilbe plants can grow quickly if they are given ideal conditions. More frequent division may be necessary. Keep the plants well watered after replanting and they will re-establish themselves quickly. Extremely little maintenance is required of Astilbe plants. The flower heads will dry on the plant and remain attractive for many months. The flowers can be cut whenever they start to look ragged or left up, for winter interest, and cut back in the spring. Astilbes are virtually trouble free, bothered by few diseases or insects. The tender, new growth may be nibbled on by groundhogs or rabbits, but once the plants have filled out, they typically don't suffer any long-term damage.